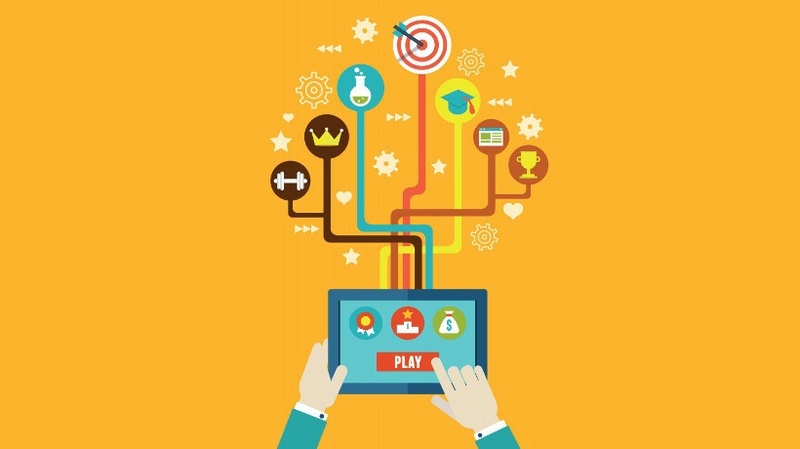 Gamification / Gamification vs Game-Based eLearning: Can You Tell The Difference? The terms “gamification” and “game-based eLearning” are sometimes used interchangeably. However, there are distinct differences between the two that all eLearning professionals should be aware of. In this article, I’ll compare and contrast gamification vs game-based eLearning and I’ll give you some useful tips on how to design an effective instructional strategy for each. Both gamification and game-based eLearning can offer your eLearning course a variety of benefits. However, it’s important to know the distinction between gamification vs game-based eLearning, so that you can choose the approach that better serves your eLearning objectives and goals, but also meets the needs of your learners. Let’s take a closer look at the basics of both gamification and game-based eLearning, in order to determine which methodology is more appropriate for your next eLearning course. By definition, gamification involves the use of game design elements and mechanics in activities that are not inherently game-based. This is done to motivate and engage the learners, so that they can become active participants in their own learning process. In essence, the eLearning experience itself, is transformed into an educational game by using achievement badges, leaderboards, point systems, level progressions, and quests. These game elements are all integrated to help the learner achieve their learning goals and objectives. On the other hand, while gamification utilizes game mechanics to transform the eLearning experience into a game, game-based eLearning integrates online games into the learning process to teach a specific skill or achieve a learning objective. Games are essentially used as eLearning activities to give learners the opportunity to acquire new knowledge or skills sets in a fun and engaging way. All eLearning games typically have rules and specific objectives and learners run the risk of “losing” when they participate. Another important distinction between gamification and game-based eLearning is that in a game-based eLearning strategy the content is designed to fit into the confines of the game. When creating your gamification strategy, it’s important to make the structure and game mechanics as simple as possible. Your learners won’t have the time to try and sort through an abundance of rules or guidelines. They want to know how to earn points or increase their rank on the leaderboard. Therefore, your explanation and overall strategy should not be complicated. Goal achievement should be the primary focus. Learners who are participating in your eLearning course want to acquire new knowledge or develop their skills. Earning points or badges is usually just a bonus. This is the reason why goal achievement should always be the primary focus of your eLearning course. All gamification mechanics you use must tie into the objectives or goals that your learners are trying to achieve. For example, if you are utilizing a badge system, then create a badge for each skill set or task that must be mastered. Intrinsic rewards, such as those that are intangible are going to be a great motivator for your learners. While other rewards, such as gift cards, might draw in certain crowds, those who really want to learn are usually inspired by something as simple as rewards that involve praise and acknowledgement. Human beings always want to be noticed for a job well done, and tapping into this source of motivation can give your learners the encouragement and drive they need to succeed. Immersion and interactivity are all-important. Learners must be immersed within the eLearning game in order to truly benefit from it. For example, if they are engaging in an interactive scenario game, they have to feel as though they can relate to the characters and situation, or else they won’t have the motivation they need to progress through the levels. A high level of interactivity must also be present. Learners should be encouraged to actively participate in the game through a variety of point-and-click actions or branching scenarios, so that they remain focused on the goals and objectives. Walk the fine line between challenging and frustrating. The issue that arises with many eLearning games is that they are either too easy to complete, which bores the learners and makes them disengage from the eLearning experience or they are overly challenging. Those that are too difficult will also make the learners disengage, as they will be too frustrated to progress through the levels. As a result, you have to ensure that you gradually increase the difficulty level of your eLearning games. Do some research about your audience beforehand. By researching your audience, you gain the ability to learn as much as possible about their past experience, educational background and professional knowledge, so that you can design an eLearning game that is ideally suited for their skill and experience levels. The learning objectives are the star of the show. While your eLearning game should be entertaining and exciting, ultimately the learning objectives are what truly matter. Everything in your eLearning game should be geared toward achieving objectives and goals and providing your learners with the key takeaways they need to modify learning behaviors or improve some aspect of their personal or professional lives. If the learning objectives aren’t the focus of your game-based eLearning course, then it’s not going to offer your learners any real value outside of the virtual classroom. Both gamification and game-based eLearning can provide your audience with the motivation and inspiration they need to get real value from your eLearning course. The trick is choosing the right approach, so that you can achieve desired results and learning outcomes by catering to the specific needs of your learners. Interested in finding out more about the science behind the success of eLearning gamification? The article The Science And The Benefits Of Gamification In eLearning explores how the brain responds to gamificationand highlights some of the most notable benefits of using gamification in your eLearning courses.